For Chinese people, the rabbit is a tame creature representing hope for a long time. It is tender and lovely. 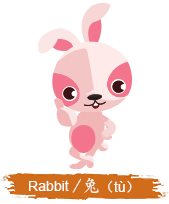 The moon goddess Chang’e in Chinese legend had a rabbit as her pet, which stimulated the thought that only this creature was amiable enough to match her noble beauty. People in Rabbit sign are not aggressive but approachable. They have a decent, noble and elegant manner. They are romantic in love and adventurous in life. They know how to make compromises to make their relationship lasting and fresh. Living together, they can become more tolerant and considerate, and life will be sweet and happy. Their relationship cannot be everlasting, for they will suffer from a series of disagreement and conflicts. They both feel suppressed in marriage life.